drwxr-xr-x 22 root root 4096 Aug 25 15:52:09 2015 ..
drwxr-xr-x 3 root root 4096 Jan 29 16:13:40 2016 . Note: dirs are considered to have a zero size. ahhhhaaa! it wants the dashes in the date of the filemask!!! Match files modified before the date or time (i.e. “older than date and time”). "WinSCP.exe" /command "open inftp@ftp.mysftpsvrprofile.com" "ls" "exit" /log="winscplog.txt"
The binaries interact w/each other and must be kept in the same folder!!! make use of Session.ExecutablePath property to force the assembly to look for the winscp.exe in a different location. it copies the assembly during build into the project Output path (e.g. <your_project_path>/obj/Debug). and have it copied to Output path automatically (by setting file property Copy to Output Directory to Copy if newer). will be included when deploying your application (e.g. an ASP.NET web app). 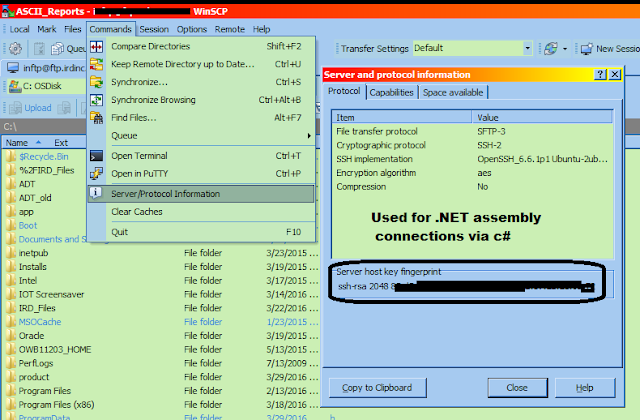 WinSCP .NET assembly exposes its full interface to COM. As a COM library, it needs to be registered before use. e.g. from C#, VB.NET or PowerShell.